Learning to write their own name is quite a milestone for a child. 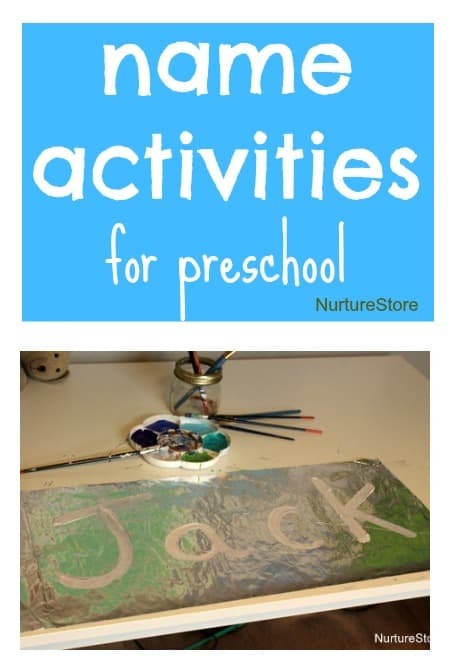 Here are some hands-on name activities for preschool that you can use to help your child practise this skill. Learning to read and write your own name combines lots of skills that children learn over time and with lots and lots of practise. And developing writing doesn’t have to be done with a pencil on a piece of paper. 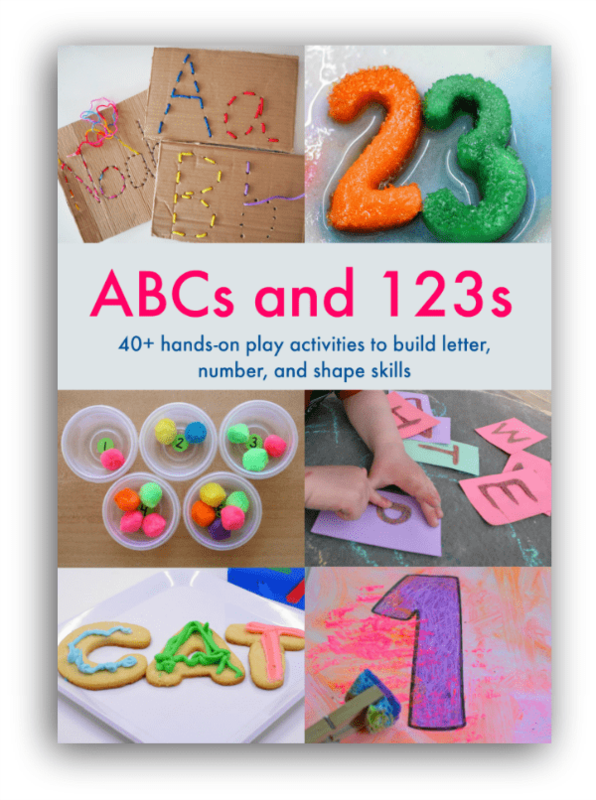 You can use lots of different materials and have fun exploring hands-on sensory learning. It’s good to start writing on a big scale, so children can get used to the shape, form and feel of letters, without having to concentrate too much on neat, little writing at this stage. Tracing out big letters in the air, with generous arm movements, is great practice. 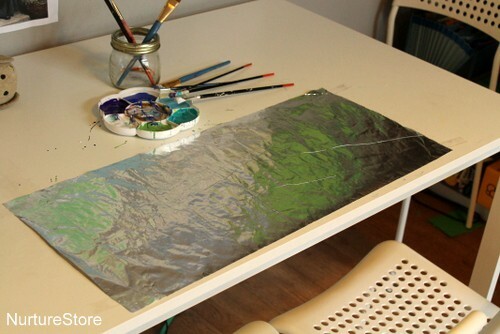 You can also try this combination of paint and tin foil. Using something other than a pencil and paper is fun! 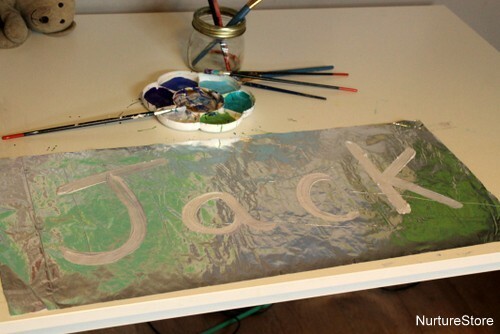 Start by laying out a big piece of tin foil, taping it at the edges to the table so it doesn’t move around and your child doesn’t have to co-ordinate their writing with also holding the paper still. 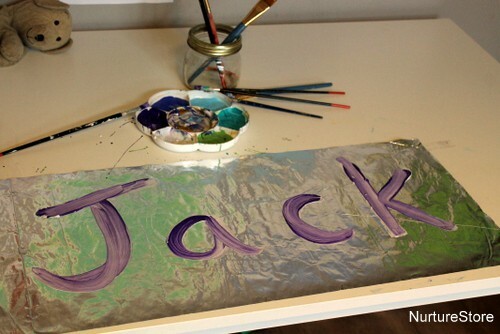 Paint out the letters of their name, in large clear letters. Don’t use all upper case letters, but rather write it as you normally would, with only the first letter as a capital. 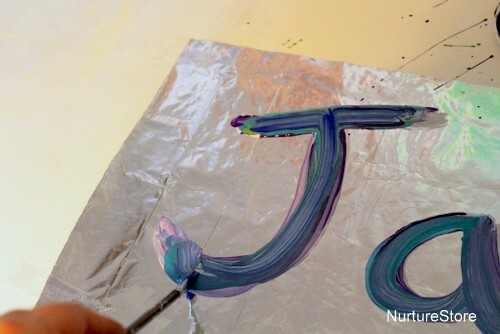 Your child can paint lots and lots of layers over each letter, getting plenty of practice at their name. Love this idea! Always looking for something that just plain on paper and markers activities. Also, as a preschool teacher, thank you for reminding people to use only the uppercase for the first letter. I’ve had so many kindergarten teachers tell me that the all uppercase habit is hard to break!